I bought this book pretty much straight after reading the first book in the series and my initial expectation would be that it would be better than the first, which was okay. It's an understatement to say that I like Star Trek and I was really hoping that it would be pulled off incredibly well here. In this book, the characters were written much more accurately. 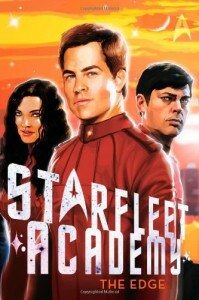 I liked how Kirk has a different girlfriend in this book, which is similar to how he has tons of love interests in the series. I'm wondering if a different girlfriend each book is a running thing in this series. I really loved how Uhura's personality was that of Zoe Saldana's version, rather than Nichelle Nichols. I like her better. Oh, and there's also more Spock in this book. Yay!